The pattern is now available as a PDF for $5.95 through Ravelry. Here’s all the pattern info and a purchase link. I accept PayPal and credit cards through my usual PayPal. The pattern isn’t for sale through the Hello Yarn shopping cart because that charges shipping and we don’t want that! ETA: I’ll still be doing kits for these. I’ve been worrying on re-dyeing the green colorway from the great disaster, when the cart sold way more kits than I had. Those will ship this week, along with the fiber club, and then it will be back to business as usual, with actual yarn for sale, and hand-dyed fiber, and more mitten kits. Thanks! ETA 2: I’m all set up on Ravelry. Ravellers and non-Ravellers alike can purchase through Ravelry. This service is still in the testing phase, so let me know if it gives you any guff (it shouldn’t). Thanks! I’m going to wait for Ravelry, though. That way it can live in my library, and all will be wonderful in the world. Woohoo! You are awesome. Will there still be sneaky kits? absolutely adorable! I love them. Will you be doing kits for these? Woot! I think I’ve found the perfect use for my leftover Hebridean 3ply…..
just amazing. thank you for making the pattern available! Wow Adrian, I am always so impressed with your knitting and your designs. 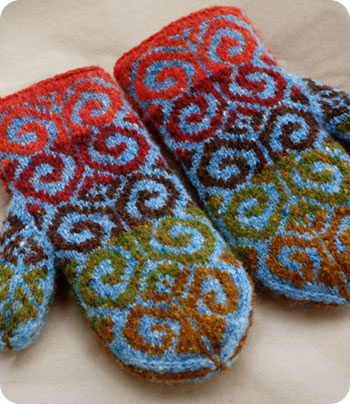 I have been seeing these mittens in your photostream and on your blog for quite a while and I love them. I am far too intimidated to try them yet, but I will! I’m excited for the next wave of kits! Woot! Yay, I’m so excited! I’m going to wait for the Ravelry option though, because I want to be able to save it in my library there, too. What a great pattern! Can’t wait to make them! Woohoo–the pattern is out! I’ve been watching the evolution of these mittens, and as a novice designer, I was blown away by the added factor of adapting the pattern to handspun and commercial yarns. All the versions are gorgeous! uh oh. Ravelry has it for free. Is that a mistake? Just stopping by to say that I have seen the Fiddlehead mittens EVERYWHERE and you have done the most fabulous job with this pattern. I was going through Ravelry last night and saw the pattern for sale. The purchase went smoothly and I love that its saved in my Ravelry library!! I can’t wait to cast on.